Morning all you lucky, lucky people. Hopefully, you and yours are all safe after the recent buffering by both Ali and Bronagh; Three Counties is still in one piece, although Philippa no longer has a greenhouse. I’d suggest the best thing to do is settle back and lose yourself in this week’s News, Views and Truths. Kicking it off is Tilray, or $TLRY on social media. Heard of it? No? You obviously do not have the same social media feed as I do. As Canada prepares to legalise marijuana next month, producers of the drug are being seen as the next big thing on US exchanges. Billions of dollars have poured into the stocks in the last few months and there’s a lot of excitement and a ton of green (money, not leaves) flying around as investors consider the kinds of opportunities these companies might have as the marijuana market in Canada grows, along with the possibility that the U.S. and other countries could one day follow suit. The value of Tilray has jumped tenfold since its initial public offering just two months ago, and is now worth considerably more than Macy’s or Hasbro, after the US Drug Enforcement Administration approved its request to export medical marijuana. Further to this, Coca-Cola acknowledged it could one day offer cannabis-infused drinks, although it doesn’t have immediate plans to sell them. That came after reports Coca-Cola was in talks with Aurora Cannabis about drinks containing cannabidiol, or CBD; a marijuana component that isn’t psychoactive. 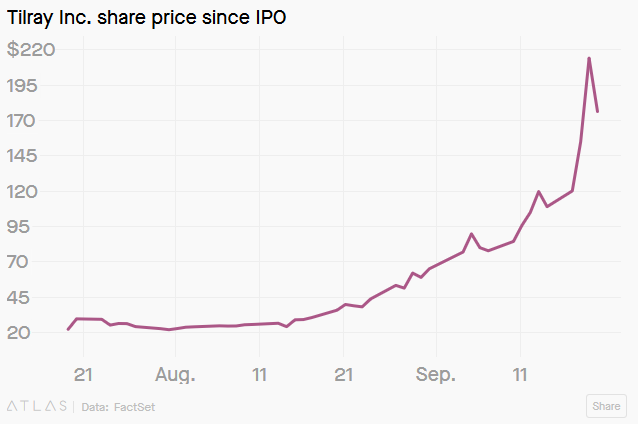 Aurora stock, which is listed in Canada, surged. In August, Molson Coors said it will team up with Hydropothecary Corp. to sell marijuana-infused drinks, and Canopy Growth announced a $4 billion investment from Constellation Brands, the company that makes Corona beer. But it’s not all one way. Like see-saws and spiders, what goes up must come back down. Yesterday, Tilray shares closed at $176.35; higher than it was even a week ago, but an 18% drop on its close Wednesday. And Wednesday was a tad wild, with an initial 90% surge, turning negative mid-day, before closing up 38%. One reason for this could be that Tilray is one of only two marijuana stocks listed in the US, along with Canopy. Many investors are restricted by internal governance to only invest and trade in US stocks and therefore a crowded trade forms. And crowded exits. Highs and lows. Literally. Closer to home and perhaps fuelled on equity market bullishness, was the announcement that the trustees of the Lloyds Bank Pension Scheme have ditched their use of a Diversified Growth Fund (DGF) in favour of allocating 100% to global equities. This comes after a number of years where DGFs have failed to impress, with returns lagging simple and cheap index tracking funds. A Diversified Growth Fund is one that looks to achieve returns through diversification into foreign currency trading and derivatives, along with traditional equities and fixed income. However, the increased costs associated with these investment strategies have not resulted in the anticipated returns and although over the past 10 years DGFs have been very much in fashion, it seems this trend is changing. This decision by the Lloyds Banking Group could be the start of a much larger evolution in pension fund management. As a scheme member nears retirement, the “glidepath” employed by the scheme investment managers will allocate their pension fund into lower risk assets in order to provide a broad-brush financial plan as opposed to a personalised one. Naturally there is an overriding question as to whether this default approach is suitable for the majority of members, especially as since more and more members chose to take advantage of pension freedoms as opposed to the traditional route of purchasing an annuity. However, I would suggest that the most important risk in retirement planning is not volatility, but shortfall risk. Not having enough money when it comes to retirement is something that people need to focus upon, while they still have time. And in my usual way, this week’s playlist looks to embrace this week’s rather eclectic blog. Have a great weekend and I shall see you all next week.